Below is a screen shot of the Admin/staff view once they have completed the above URL string. 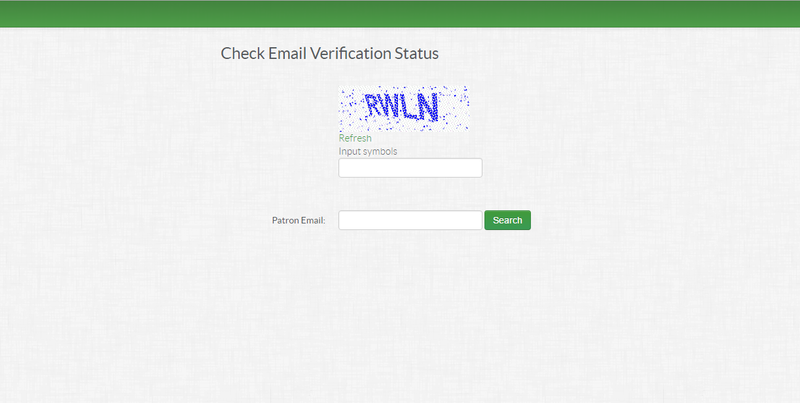 In this modal, the Admin/staff will fill in the Captcha and email address, then click search. If the patron's name appears in Green, the patron's email address is VERIFIED within our system and no other action needs to be taken to receive email from within the system. However, If the patron's name appears in Red, they are NOT VERIFIED in our system and the patron will need to verify their email address before they can receive ANY emails from ANY Evanced products. If the 72 hour link has expired, the patron has the ability to get a similar verification email sent to the same email address. This process is facilitated through sending an email to the email address: "verify@evancedsolutions.com". When a patron sends an email to this address they will be sent a secondary verification email. Each outbound verification email is tailored towards the product which it is coming from (e.g. Events, Room Reserve, Summer Reader) along with library specificity, but if you wish to customize these templates further there are certain segments which are able to be changed (as long as it stays within the industry guidelines). For any configuration changes, reach out to Evanced Support to have them facilitate the change. For more information on the full overview of our Amazon SES email Opt-in verification process please click here. *** Please note, throughout the use of the program, the patron will continue to receive the same verification messages whether their email has been verified or not. However, in order to receive program emails, the patron will need to go through the verification process. Example: If Sarah registers for an event, she will still receive the program message that she has been registered for the event within the program (in other words, there will be no mention of email verification), however, she will NOT get the registration verification email until her email has been verified. Posted - Mon, Apr 4, 2016 at 1:10 PM. This article has been viewed 2832 times.